The Government's latest move to ease congestion during peak hours by rolling out free train travel to the city before 7.45am has been applauded by some commuters. But others were sceptical about whether the dangled carrot of monetary savings would be enough to make people leave for work earlier. This is because some employers may not be flexible enough to allow their staff to start - and end - work earlier. Early birds could end up working longer hours. Business analyst Yvette Kan, 28, who lives in Sengkang, said she would have to wake up at 6am in order to reach her workplace in Tanjong Pagar by 7.45am. She said: "The money saved is not worth it. This will work only if my company supports the move and allows me to go off early, or it would mean working much longer." While on a visit to Raffles Place MRT station yesterday, Transport Minister Lui Tuck Yew announced that the Land Transport Authority will begin a one-year trial from June 24 offering free travel to those who exit from 16 MRT stations before 7.45am on weekdays. 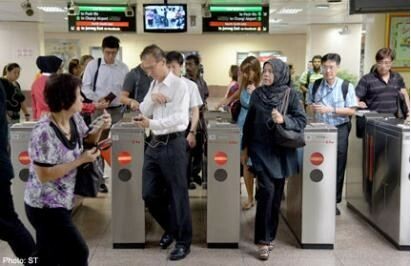 They include stops such as Orchard, Raffles Place, Tanjong Pagar, Clarke Quay and Chinatown. It will not be free if commuters began their journeys at these stations. A discount of up to 50 cents will be offered to commuters if they exit these stations between 7.45am and 8am. Mr Lui hopes the move will be "impactful enough" to spur 10 to 20 per cent of commuters to travel earlier. Some 59,000 people exit the 16 stations between 8.30am and 9am, compared to 23,000 people between 7am and 7.45am. Mr Lui said the initiative, which would cost $10 million, will be funded by the Government, and that it would not affect future fare adjustments. Dr Janil Puthucheary, Member of Parliament for Pasir Ris-Punggol Group Representation Constituency, mooted free peak-hour trips during the Budget debate last month. He told My Paper yesterday that there is a need to persuade firms to change workplace practices. "We are facing a tight labour market with a competition for workers. Having a work environment that is more attractive may be a deciding factor on how easy it is for employers to attract skilled talents," he said. National University of Singapore transport researcher Lee Der Horng said that staff who opt to travel earlier for free "will avoid the hassle of peak-hour travel and come to work happy". This will translate to better work productivity for such employees, which companies should be aware of and look to accommodate, Associate Professor Lee said.